For those of you who follow me on Facebook and Instagram will have seen, I'm back in the USA! I flew out on the 11th of January from London to Los Angeles JUST in time for Desertfox Events: Battle for Lost Angeles and that is just the beginning! Despite check-in and security/boarding at London Gatwick being super smooth, my flights to the States was less than comfortable this time around! If it could go wrong, it did! Take off delayed due to aircraft crew forgetting the paperwork for the flight, poor plane food (and the crew forgetting my second meal), getting no sleep on the flight thanks to other passengers, a medical emergency onboard during flight AND to top it all off, the jet breach being broken on arrival at LAX which meant a 40 minute wait on the plane until it was fixed. However, the saving grace for the flight experience was how smooth customs and baggage claim was on arrival! Jet, Leah and Dayton arrived just in time to meet me outside the terminal doors and off we went to Victorville, CA for pre-game Fajitas and Champagne! Friday 12th January, was mostly spent preparing for game on, on Saturday - preparing our loadouts etc! In the afternoon we headed to George Airforce Base in Victorville, CA for the registration/safety brief and the Blue Fox Tracker app for DFE: Battle for Lost Angeles. Leah, Dayton and myself prepping for the game! My loadout for DFE: Battle for Lost Angeles was inspired by Tom Clancy's The Division and I gave it a little lumbertac twist using the Eastern Royal Trading colours! For this loadout I wore: 5.11 Tactical beanie, Wiley X Saber Shooting Glasses, Respirator, Red plaid Faded shirt, PIG Delta Utility Gloves in Tan, LBT Tactical MultiCam Black Plate Carrier, Emerson G3 MultiCam Black Combats, Salomon Quest Prime GTX boots and for my GAT I used an Umbrella Armoury upgraded VFC Avalon with PTS EPM mid-cap magazines! Although I can't go into too much detail about DFE: Battle for Lost Angeles as this will be covered in a separate blog post! Game on kicked off at 10am on Saturday morning and we played through until the end of the night game at 8pm! 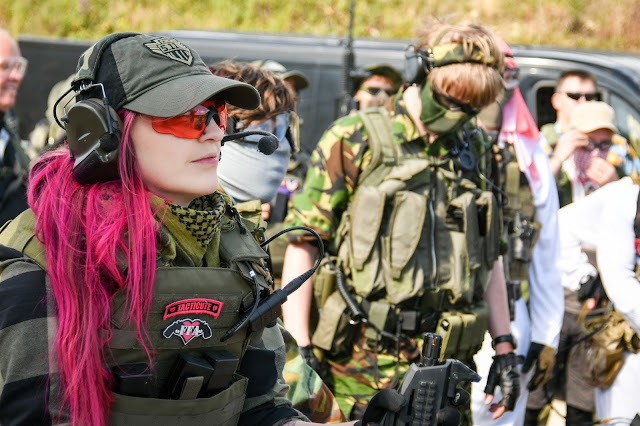 On Sunday, game play resumed at 10am and promptly ended at 1pm ready for the sponsors raffle which included everything from smoke grenades, patches to airsoft guns! On the 16th January, I celebrated my 26th birthday almost 6,000 miles away from my home in the U.K. It *can* be pretty hard spending birthdays and such away from home but my US boos made sure that I was spoiled on my birthday with cake, birthday mani-pedis and wine! On Friday 19th January, my friends over at Enola Gaye USA pick me up from Victorville, California to make the drive to Las Vegas, Nevada ready for SHOT Show 2018 so get ready for coverage from the show on airsoft guns, tactical kit and even firearms as FFA takes to the range! I'm SO looking forward to sharing my US 2018 adventures with you!